All portable freestanding signs (including "A-boards") require a sign permit, but often can be approved at the staff level if they meet guidelines for size and materials. Only one portable freestanding sign is allowable per business (even if located on private property), and there are requirements as to the sign's location, sidewalk clearance, hours of display, proof of insurance (naming the City as additional insured), etc. 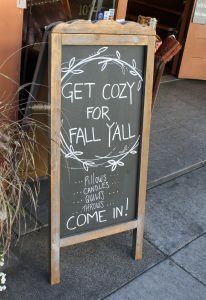 Sidewalk signs are not allowed for businesses fronting on the Plaza, and restrictions apply for businesses located in alleyways and paseos. To apply for a permit for a freestanding sign, contact the Planning Department.